Space heating accounts for 29% of personal greenhouse gas emissions in Canada, second only to passenger road transportation. Other northern countries also face the space heating challenge when trying to attain environmental sustainability. 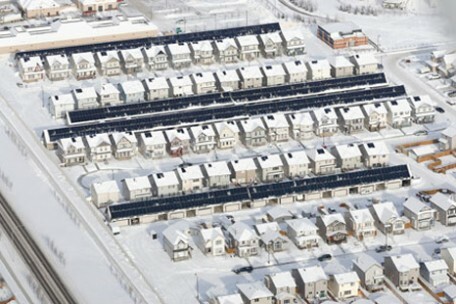 Doug McClenahan of Natural Resources Canada, a federal department of the Government of Canada, used his decades of experience working with solar and other clean technologies to initiate the Drake Landing Solar Community, a master planned neighborhood of 52 homes just outside of Calgary, Alberta. The community is the first of its kind to use high fraction borehole thermal energy storage (BTES), a technology that stores solar power in the ground to save it for winter space heating use. Despite sub-zero temperatures, Drake Landing’s innovative heating system delivers 90% of every home’s space heating needs throughout the year using solar energy. Drake Landing recently took home this year’s Energy Globe World award for its innovative technology and successful performance. 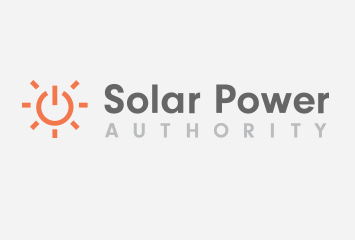 Cleantech Authority spoke with McClenahan about the project and future implementations of this technology. How Does Your BTES Technology Work? The concept is fairly simple. It collects solar energy during the summertime and stores it in the soil through a system of boreholes, which is just like a giant heat exchanger in the ground to get the heat into the soil. We then recover that heat when we need it, such as when there isn’t a lot of solar radiation in the winter and there’s a lot of heat load. Can This Technology Warm Homes Throughout the Cold Canadian Winter? 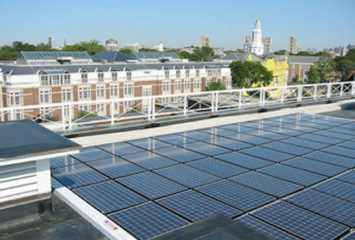 It’s designed to provide an average of approximately 92% of the heat demand from solar. It takes a number of years to build up to that steady state performance. So now that we’re in year five, we’re just approaching that right now. Last year we were 86% solar fraction. The year before that we were 80%. So we hope this year, unless it’s a really strange weather year, to be up around 90%. After December 21st we get more and more daylight hours and by February we can even get days when the system can be recharged a little bit. Then by March and April, you’re home free. When You Get Really Cold Days of -40 Degrees Celsius do You Need to Use the Backup Gas Boiler or Can Your System Handle It? It depends on the time of year. We can handle it early on if it was a really cold November or December. If we get -40 in January or February the boiler would likely have to come on at that point because our soil temperature would probably have reduced. Fortunately, those really cold periods don’t last that long. It’s a small percentage of time in the year that you’re at the really cold temperatures — maybe 5% or something like that — even though it represents a large part of the heating load. So far this year we’ve experienced -20s and there was no problem providing 100% solar heat at those temperatures. What Have Residents’ Reviews Been Like? Excellent. All their comments have been very positive. They’re like-minded people wanting to live in a community like that. They’re very much environmentally conscious and want to bring their kids up in that environment. They have their street parties and have musicians come in. They love it out there. Is Drake Landing Meeting the 5 Tonnes Per Home Annual Decrease in Greenhouse Gas Emissions Target? Yes. That’s based on a combination of energy efficiency plus solar contribution. And that’s the contribution at the 90% solar fraction level or slightly higher at year 5, year 6, which is what we’re getting into right now. So, the system has been performing as expected so far. Have any of the Homes Been Resold Yet? Do These Homes Have a Higher Resale Value than Conventional Homes? Yes, there have been a number resold. There’s anecdotal evidence that there is a premium. When they were sold they started out at around $230,000 each. They now sell for twice that. I think we had about 10 families for every home on a waiting list back then. We had people moving from different parts of the country. A couple even moved from the U.S. just to live in the community. So it attracted a lot of attention and since that time I’ve had calls from a number of people wondering when the next community like this is going to be built. When is the Next Community Going to be Built? We’re keen on moving to the next step. For us the next step is looking at a larger scale community. Drake Landing was considered a technical demonstration. It was never considered to be economic at that scale because it’s too small. The borehole storage is quite small and the efficiency is fairly low, but we knew that we wanted to use Drake Landing as a means to verify the computer models and predicting the performance. Then we would take those models to design a much larger community. We’re in the process of doing that now as we’re looking at a number of possible new solar communities in Alberta or even Whitehorse in the Yukon. Because of this project’s publicity a lot of communities across Canada have expressed interest for some of their new developments to introduce this new concept. A proposal came in to our department to build a larger scale one and we’ll see whether that gets accepted in the next few months. DLSC was a Project Conceived by Natural Resources Canada. Most People Don’t Think of a Government Department Initiating a Project Such as This. How Did It Come About? It wasn’t something that happened on the spur of the moment. My first job was working at the University of Toronto with Prof. Frank Cooper, considered one of Canada’s pioneers in solar energy. One of the concepts that he was really interested in exploring was solar seasonal storage. I started working with him when he was on contract with the U.S. Department of Energy to model and do research in the area back in the late 70s, early 80s. And that’s where I got my inspiration and learned about the potential for this concept in Canada. When that work wound up I eventually moved to Ottawa to manage a solar thermal research program in 1986. During that period I was always looking for an opportunity to build a project like this, having had some background already in it. However, there needed to be a number of components in place before such a project could be proposed. We needed solar companies that could supply good quality collectors, a utility that would be willing to own and operate such a system, good computer models for predicting the performance of heat in underground storage, and funding programs that would assist the project. We did a lot of work on other applications at Natural Resources Canada to go after the low hanging fruit, but by the early 2000s we started looking into space heating and what we can do in Canada. That’s when I promoted the concept of seasonal storage. How Did You Implement the Project? First we needed a developer, a builder, a utility, and a municipality. Then we put together a number of federal, provincial, and other funding partners. Since the private sector had no experience with this concept, we funded the extra costs for the solar and storage, thus removing the financial risk associated with the project. Since we were using quite accurate simulation tools, we were able to convince them that you could displace almost all of the space heating with solar using seasonal storage. One of the first steps our team took was to do a study tour in Europe of similar projects that were at a lower solar fraction. During that tour we consolidated the main concept and design ideas. That was a great start. From there we went to the detailed design phase and then ultimately to the construction. Why Has it Taken so Long to Implement Another Project? The main thing is cost. Especially in Canada we have very low cost energy. Even when putting insulation in homes it’s hard to get a payback. Until energy prices really go up quite a bit higher than what they are, it’s going to be difficult for utilities to fund a project such as this on their own and do it as a business case. The next step is to get the cost down by going to a larger scale project. We just finished a round of performance and cost estimations for the larger scale project and it looks like the cost can be reduced anywhere from 35 to 50% compared to the original Drake Landing. But, it’s still in an area with low cost conventional natural gas. So, we’re looking at other areas in Canada where heating energy costs are higher, such as Whitehorse. They don’t have natural gas and they use oil for their heating, which is six times the cost of natural gas in Alberta. Also, a lot of people are waiting to make sure this first system performs well. All the messages we’ve been putting out so far have been yes, everything is on track. We’re looking good for the over 90% solar fraction that we said. But you can imagine that people were waiting to see that type of information come out before they look more closely at it themselves. The country that’s really taking off in large scale solar district heating — with and without seasonal storage — right now is Denmark. The number of systems going in has just risen exponentially and it is related to the price of energy. Their taxes appear to be higher than other countries to the point where solar is competitive. So, those systems are going in without subsidy, which is interesting. All the previous systems in Sweden, in Germany, even this one in Canada required subsidies because the cost of natural gas or other heating forms were much lower. Really, Denmark is an example of what we’re going to see in the future when the price of energy increases and solar is competitive.